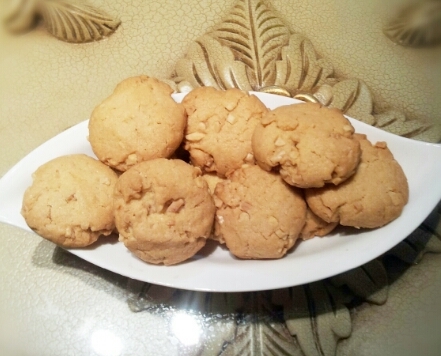 Almond Cookie is commonly served during Chinese New Year. I tried a different recipe that called for baking ammonia . I’ve never used it before but I understand that baking ammonia is suitable in baked products for crunchy and crispy texture. Very good, I couldn’t stop at just one. Source : adapted from Sotong Cooks – Cooking it my way! 1. Beat together butter, sugar, salt (if using) and ammonia till light and fluffy. 2. Add in eggs and vanilla extract, mix to combine well. 3. Sift together plain flour, baking soda and ground almonds. Then mix with butter mixture. Fold in toasted almond nibs . 4. Pinch a small piece of dough about 10 g and shape into a ball. Place it onto a greased baking pan and flatten lightly. Lightly brush the cookies with egg wash. Place almond flake on top ( I omitted ). 5. Bake at 170°C for 20 minutes or until lightly golden. 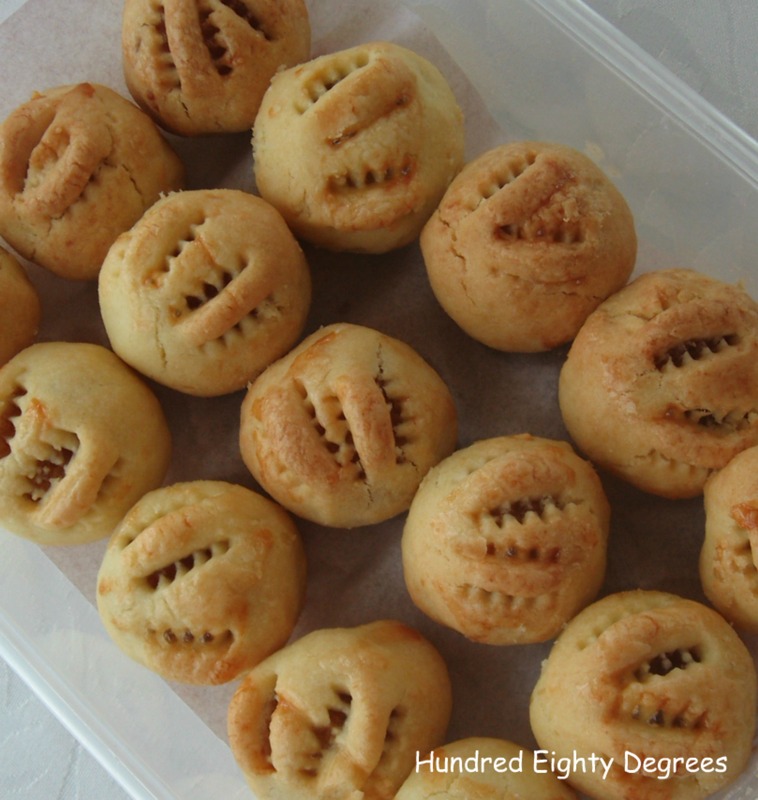 Bored with the usual CNY cookies? 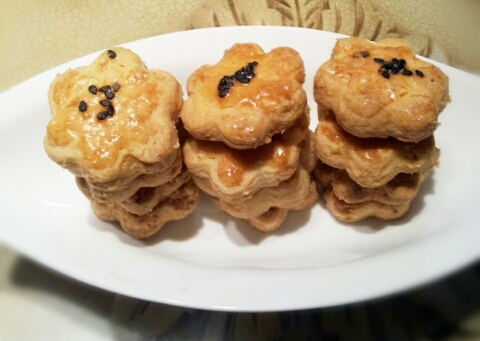 How about trying out savory cookie? 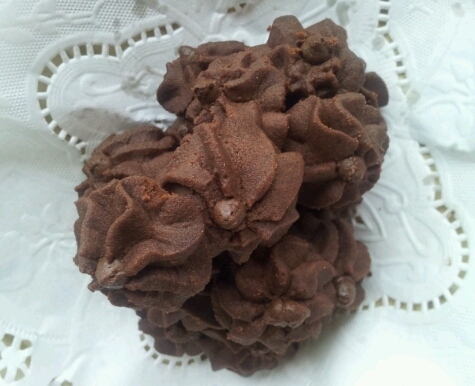 This salted egg yolks cookie caught my attention when I was searching for something unique to bake for Chinese New Year. 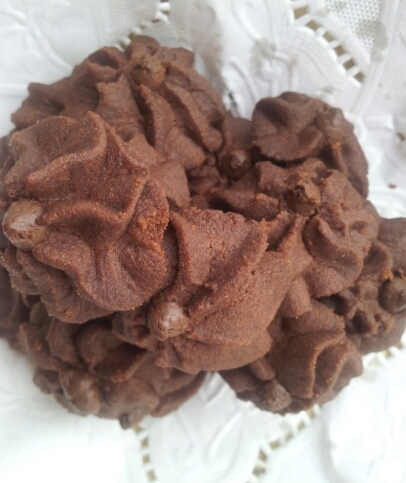 This cookie has the salted egg yolks pungent, tasty and addictive. 1. Sift together flour, cornflour, baking powder, bicarbonate of soda and milk powder, set aside. 2. Steam salted egg yolks for about 5 minutes. Cool, mash with a fork and set aside. 3. Place butter, shortening ( if using ), salt ( if using ) and sugar in the bowl of an electric mixer. Mix on medium speed until sugar is dissolved. 4. Add mashed salted egg yolks and sifted flours. Mix to get a soft and pliable dough. If dough is too soft, wrap with cling film and rest in refrigerator for 30 minutes ( my dough works out fine for me so I did not chill ). 5. Line baking paper on the baking pans. Preheat oven to 175oC. 6. Roll out dough to 5mm thickness and cut into desired shapes using dough cutters. Place on baking pans and brush with egg wash. Sprinkle with sesame seeds to decorate. 7. Bake for 18-20 minutes or until golden brown. Remove and cool completely before storing in airtight containers. 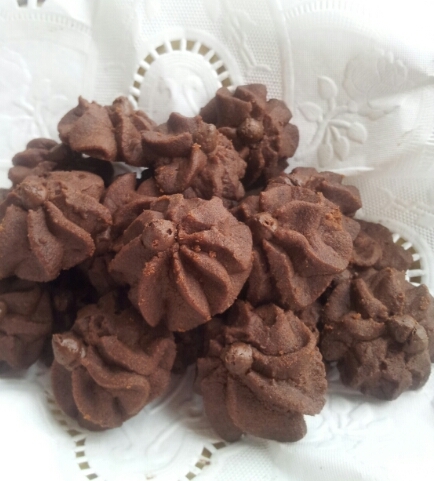 After seeing this at eileenの记事本 , I think dipping cookies in chocolate creates a beautiful look that would make a perfect gift since Bebe requested to bake for her teachers. This cookie is made of ground almond with a whole almond wrapped up in the centre and when the cookie is cooked, dipped in melted chocolate. Coating cookie in chocolate was no mean feat to me and it took me awhile to do. Actually, I enjoyed this cookie without chocolate coating more as they are less sweet and the ground almond is not overpowered by the chocolate. 1. Cream butter and icing sugar, mix in whole egg and egg yolk till well combine. 2. Mix in B using spatula to form a soft dough. 3. Take about 6g dough, wrap up 1 almond and roll into round or oval shape. Place cookie dough on lined baking tray. 4. Bake in a preheated oven at 170 degrees C for 12 minutes or until cooked and golden. Remove and cool on wire rack. ( I baked for 15-18 minutes ). 5. 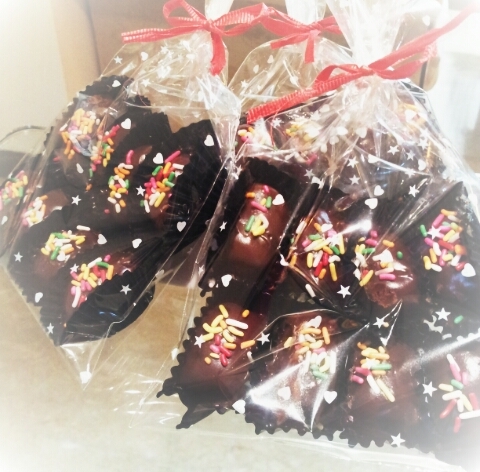 When cooled, coat cookie with melted chocolate, place in a small paper case and sprinkle toasted almond nibs ( or rainbow rice ). 6. 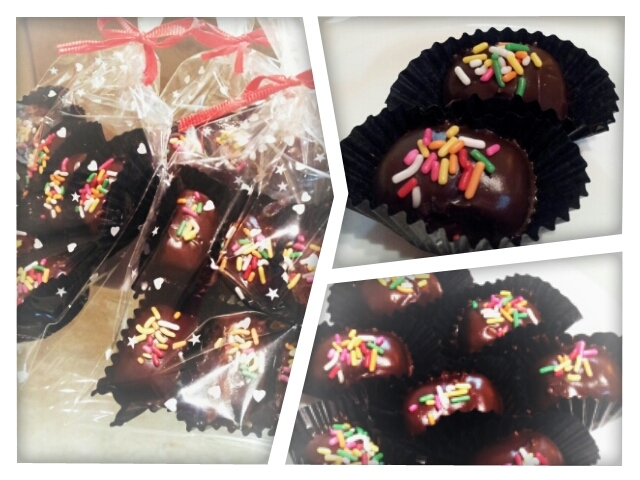 Set aside till chocolate is completely set before storing in airtight container. 1. These cookies after coating do not need to refrigerate. Mine keeps well in an airtight container for as long as 5 days at room temperature. 2. 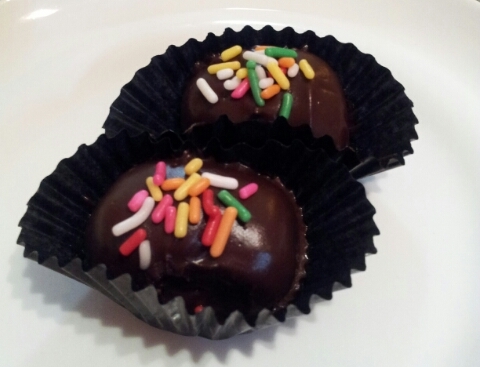 You may keep the cookies and coat with melted chocolate one day before serving. They are crispy and crunchy. The first bite into the cookie is the crisp & crunch from the cornflakes, and follow up by the significant aroma from the toasted hazelnut. They are perfect! 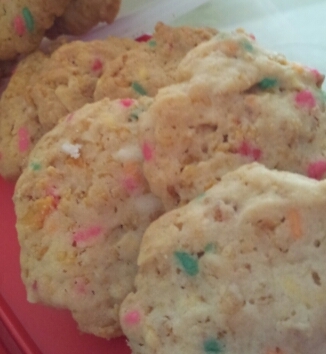 I think the rainbow rice has brightened up these plain looking cookies, you think so? 1. Preheat oven 170 degrees C.
2. Cream butter and sugar until light and creamy using mixer or wooden spoon ( I used wooden spoon ). 3. Add egg and mix well. 4. Fold in flour, cornflakes, hazelnuts and rainbow rice and mix well. 5. Shape the dough into small balls and flatten with a wet fork. 6. Bake on middle rack for 15-20 minutes. I’ve mistaken icing sugar for flour and ended up with a mixture of icing sugar and valrhona cocoa powder. 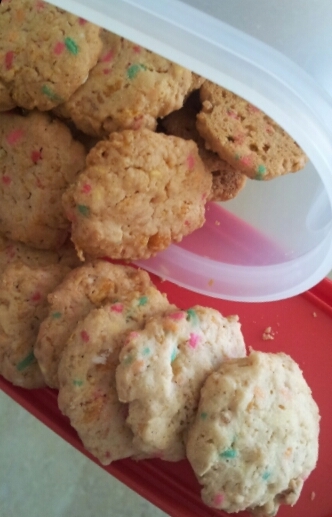 I didn’t want to risk this batch of cookies with the wrong mixture, therefore I packed them up and kept in the fridge hoping to use them for other recipes. Anyone has any ideas of what can be done with this ‘pre-mix cocoa icing sugar’ ( sounds better, haha! )? Please drop me a line. 1. Preheat oven to 175C. Line the pan with baking sheet, set aside. 2. Get ready with a pastry bag fitted with a (Wilton 1M) tip, set aside. 3. Sieve flour and cocoa powder together, set aside. 4. Beat butter, icing sugar, and salt (if using) at medium speed until light and fluffy. 5. Then add the coffee mixture and egg white and beat until well incorporated. Scrape down the sides of the bowl with a rubber spatula as needed. 6. Turn mixer on low and slowly add in the dry ingredients. Mix until just combined and transfer the dough into the prepared pastry bag. 7. Pipe dough onto prepared baking sheet and top with a piece of chocolate chip in the middle of each dough and bake for about 12 minutes. 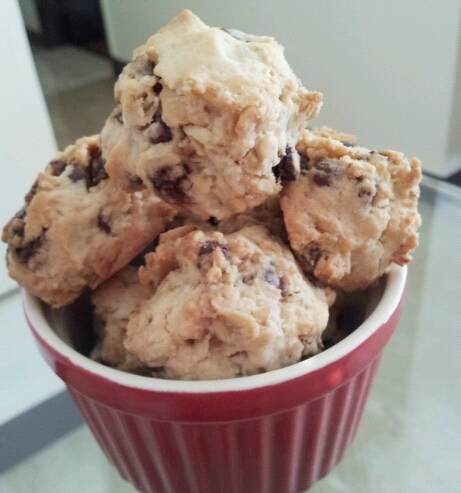 I’ve been craving for raisin oat cookies lately. Raisin and oat may look humble by themselves but they are a perfect match. These cookies are crunchy outside and a little soft inside, scone-like texture. 1. Preheat oven to 160 degrees C. Line baking sheets on baking pan. 2. Sift plain flour and custard powder together. Set aside. 3. Beat butter and sugar until light and fluffy. Add in eggs and vanilla extract, beat until combined. 4. 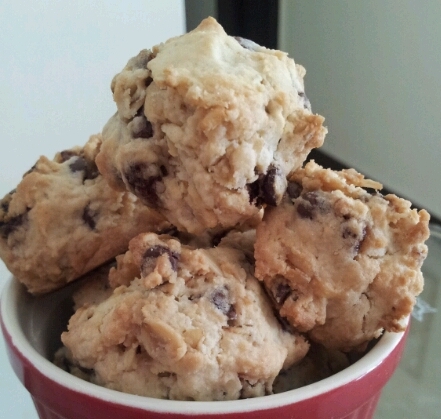 Add in flour mixture, oat, raisins and chocolate chips, mix to combine well. 5. Drop dough by using tablespoon onto baking pan. Bake for 20 mins. Bought 4 kilos pineapple paste but still have a substantial amount of it from the previous pineapple tart baking. I should not expect much vistation as CNY celebration is coming to an end. Having that in mind, I decided to try out a new recipe afterall it’s for own consumption, so it didn’t really matter if it didn’t turn out well. However, they were surprisingly tasty. A little crispy and completely melt-in-your mouth. 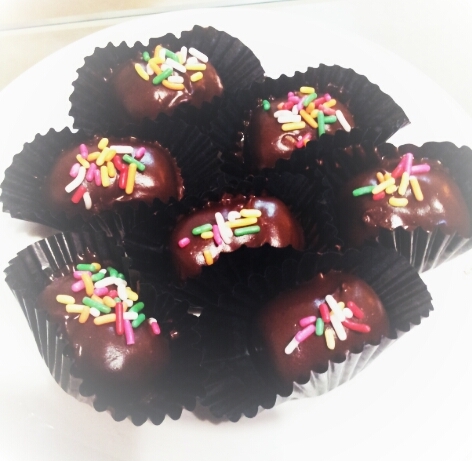 The amount of milk powder used is just nice to enhance the flavour. 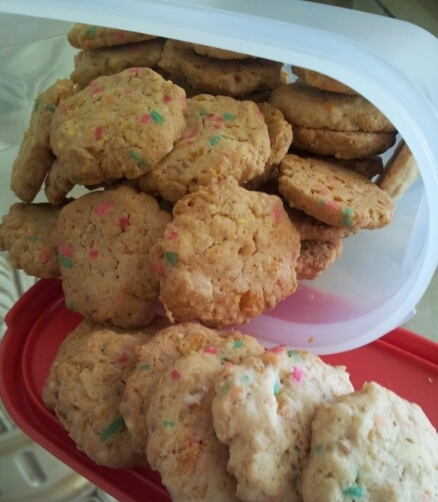 I couldn’t resist baking anther batch even after cleaning up the kitchen. 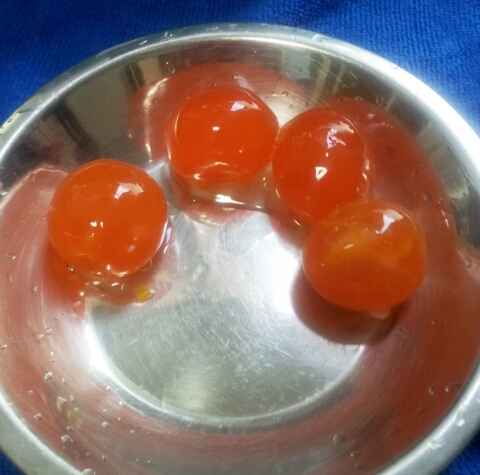 1 egg yolk + 2 drops of cooking oil and water for egg wash.
1. Cream butter for 3 mins, add in egg yolks and beat for 3 more mins until light and creamy. Add in vanilla extract and mix well to combine. 2. Sift flours, milk powder and icing sugar together, add into butter mixture. Using spatula to mix by pressing them together. Knead for a few mintues to form dough ( do not over-knead ). 4. Divide dough into 8g each, flatten and place pineapple paste in the middle. Bring the edges together and seal. Roll in between palms to shape into round. Place on baking tray lined with baking sheet. 6. Allow tarts to cool completely before storing .